Granting huge mortgages on rent-regulated buildings doesn’t make financial sense—unless lenders know buyers will kick out existing tenants. Kim Powell has lived in West Harlem all her life, most of it in her rent-regulated apartment. The 53-year-old remembers cruising the neighborhood in her father’s car as a kid, looking at the gutted and burned-out buildings of the 1970s. But over the last two decades many of the homes and shops in Powell’s neighborhood have been restored. As early as the 2000s, gentrified Harlem was on the entire country’s radar as Bill Clinton set up offices for his foundation in the neighborhood. It was around then that the Pinnacle Group, the owner of Powell’s building at 706 Riverside Drive, started planning a condominium conversion for the property. This article is part of our podcast series There Goes the Neighborhood, produced in partnership with WNYC Studios. Subscribe at iTunes. Gentrification as a theory is sprawling and chaotic. Gentrification as it plays out in real life on the streets is always exacting—lot measurements, rent rolls, income levels. Each number is part of an investor’s plan. And each investor in the city’s housing market is operating independently, executing a specific plan for this building or that neighborhood—everyone’s got a niche. But what bonds these disparate players together is the institutional support they receive: aspirational mortgages from banks that are predicated on displacement of rent-regulated tenants. In the case of 706 Riverside Drive, the condominium-conversion plan was made possible by a Wells Fargo mortgage. Pinnacle managed to secure a mortgage based not on the actual income a developer could draw from the property at the time, but on the potential income if the building’s units were flipped from affordable to luxury. In New York, this is an alarmingly regular practice. Powell has lived at 706 Riverside for 37 years and, like most of her neighbors, her apartment is rent stabilized. Apartments included in New York’s rent-stabilization program have measured rent increases set annually by the city’s Rent Guidelines Board, which generally approves something between a 1 and 4 percent hike each year. That keeps the income a developer can get out of a rent-stabilized building relatively flat. But the flat income also makes those buildings relatively cheap to buy, when measured against the premiums paid throughout the New York real estate market. So when the property makes the jump from a regulated rent roll to market rate condominiums, the returns that an investor sees are steep, and fast—if they have the bank capital to make it through that transition. 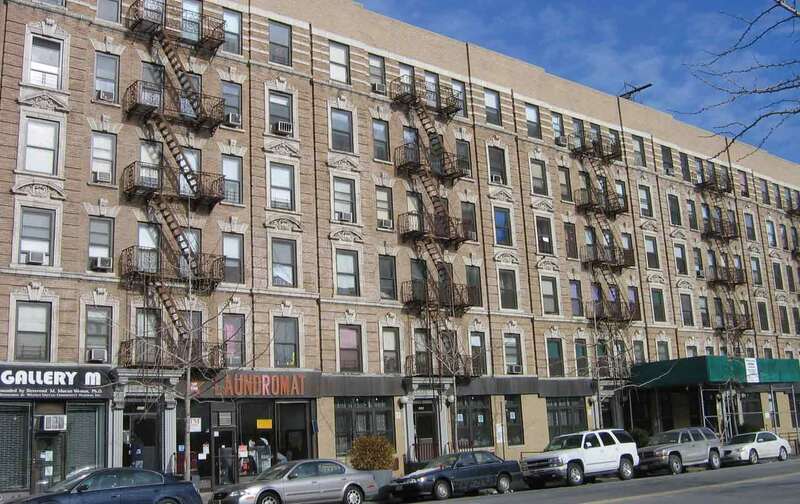 As part of the condominium-conversion process, Pinnacle was required by state law to offer tenants in rent-stabilized apartments the opportunity to buy their own units. If the tenants turned down the offer to buy, they still had the right to remain as long as they fulfilled the terms of the lease. In 2007, when the city approved the request to put 706 Riverside Drive through condominium conversion, Pinnacle had buyers for 10 apartments and reported a rent roll of $28,015 a month for the remaining 41 units in the building. Despite this modest, relatively fixed income generated by the property, Wells Fargo granted Pinnacle a blanket mortgage of $34 million for 706 Riverside Drive, along with 10 other adjacent buildings of similar size and with similarly modest rent rolls. That “illegal activity,” according to Powell, was pressuring tenants in rent-stabilized units to move out so that those apartments could be sold at market rate as condominiums. “We found out they took one-quarter of their tenants to court on frivolous claims—when the tenant paid the rent and they withheld the rent, when the tenant was entitled to succession rights. This was a clear indication that their effort was to drive as many rent-regulated tenants out of their apartments,” says Powell. And the agreement reached in settling the lawsuit supports her claims: Pinnacle was required to create a $1.3 million fund for tenants filing claims for damages and to partner with a community-based organization to administer the money. Pinnacle was also ordered to comply with laws protecting tenants in rent-stabilized units. When I called Pinnacle to speak to its principal, Joel Wiener, I was told he was not available and that he does not have an email address or a voicemail box. I asked if there was someone who else might be able to answer my questions about 706 Riverside Drive and when I did, the woman on the line—who would not give her name—hung up. Kim Powell was hoping that her building’s lawsuit would send a message about the dangers of letting investors carry the kind of debt Wells Fargo gave to Pinnacle—financing that is incongruous with a building’s actual income, only in step with its potential if flipped. It hasn’t. Investors still manage to secure these mortgages for property throughout New York’s gentrifying neighborhoods. Take, for instance, 241-245 Ocean Parkway in Brooklyn. BCB Property Management acquired the building in 2015 for just over $10 million, using a mortgage from Deutsche Bank with a down payment of a mere 7 percent. That’s more than $9 million of debt for a 32-unit building of mostly rent-stabilized apartments, in a neighborhood where market rate, one-bedroom apartments rent for $1,500. The mortgage only makes sense mathematically if the tenants in rent-stabilized apartments are moved out and replaced with tenants paying market rate—and if the neighborhood rental market continues to climb. New York’s rent-regulation laws allow a landlord to take an apartment out of the rent-stabilization program once the monthly rent hits $2,700—a number easily achieved when a portion of renovation costs can be tacked on to rent, along with a 20 percent “vacancy increase” just for emptying the place. No condominium conversion required. One more example: Renaissance Realty acquired two buildings across the street from one another at 285 Schenectady Avenue and 1646 Union Street in the Brooklyn neighborhood of Crown Heights. The 61 units in these buildings are rent regulated, with a one-bedroom apartment renting for approximately $1,100 a month, on average. Yet Renaissance is carrying multiple mortgages on the properties, some of which are shared by both buildings, totaling nearly $6 million. Anyone living in Crown Heights or familiar with the various real-estate markets in this gentrifying neighborhood probably wouldn’t argue that a property with 61 units might very well be worth $6 million. But that math is tethered to the near future—when the units are no longer regulated. Through careful maneuvering of the rent-regulation laws, Renaissance is now trying to significantly raise the rents in these two buildings; in some cases, they are doubling what tenants are currently paying. In response, several of the tenants have organized and refuse to sign the new leases with the steep increases that they’ve been presented. Renaissance has taken them to court and the case is pending. Representatives from Wells Fargo and Deutsche Bank said they do not publicly discuss the particulars of any client’s mortgage. BCB Property and Renaissance Realty did not return calls and e-mails to discuss their respective properties. DW GibsonDW Gibson is author of the recently published book The Edge Becomes the Center: An Oral History of Gentrification in the Twenty-First Century.